On Labor Day, I completed my first organized “race” (well, unless you count the 100 yard dash in the elementary school field day as an organized race). I put “race” in quotes because I hardly sprinted. Barely even ran. I’m a walker, mostly, but still it was organized, and timed, and there were prizes for winning, and medals for finishing. That’s a race people. It was a half marathon — 13.1 miles of pure pleasure. And torture. I must admit, I’m rather proud of myself. Given that I am almost 17 months post-heart attack, and only a couple of months post foot surgery, I’m OK with fulfilling one of the seven deadly sins — pride. I don’t think I’ve taken it to the extreme, nor should I be punished (according to Dante) by hauling a stone slab around Purgatory for all eternity. 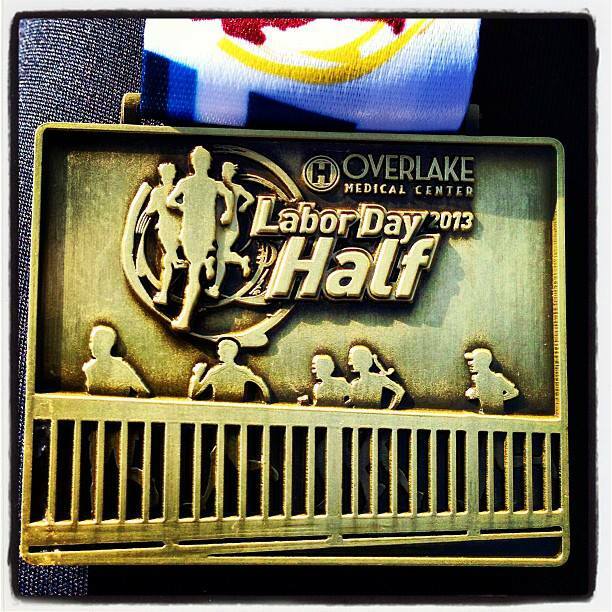 A little pride, mixed with a healthy dose of hubris, is OK.
What did I learn by partaking in an organized race? The first thing I learned, or rather re-confirmed, is that I am just a tad bit competitive. Going into the race, I thought it was going to be me just me against the clock. I had one primary goal — finishing, and a secondary goal of finishing in less than 3.5 hours. But as the runners and walkers gathered in the starting corral, I looked around. The guy next to me was 74 years old, and I thought to myself, “Self, you can’t let a 74 year old guy beat you”. Just behind me were three ladies that I guessed were in their mid-fifties. They were laughing and joking and literally 3 seconds after the start loudly proclaimed, “There are still people behind us, we’re not last!” Yeah, I want to finish, but no one wants to finish last. So the competitive streak in me kicked into gear when the race started (I was a little disappointed that a starter’s gun was not involved) and I ran. Like actually ran, not walked. And I passed people, which was pretty cool. I lost track of the 74 year old and the Laughing Ladies. OK, so the running part only lasted about half a mile, but jostling among 1,000 other participants and passing people was a blast. Problem was, I went out too hard and too fast. I didn’t think so at the time, but around 11.5 miles into it, I would pay for that. More on that near tragedy later. The next thing I learned was that having people along the race route cheer for you is almost as cool as having the cops stop traffic for you. Neither of those things happened during all those miles of training leading up to the event. The cheers were motivating, and helped ease the pain. I also learned, sadly, that people cheat in races. Really? Really. This half marathon course included a couple of places where the route doubled back on itself, so when you made the turn, there were people that were behind you in the miles actually running toward you. And I saw four people cut across and start running the other direction. Some cut a good half a mile off the route by doing this. And they collected a “finisher’s medal” at the end. Really? You’re only cheating yourself people. 12.6 miles is not a half marathon. You didn’t finish, you cheated. It seems… stupid. The last thing I learned was that leg cramps really, really hurt. I’ve walked over four million steps training for this thing (literally, thank you FitBit) and not once had a cramp. But roughly 11.5 miles into this thing, just 1.6 miles from the finish line, my left leg from the knee to the tips of my toes (not the foot that had surgery mind you) locked up so tight I couldn’t take a step. Wow, did that hurt. I stopped, I had no other choice, and massaged my calf. Took another step and it cramped up again. This time I flopped around the ground like a freshly caught Washington state salmon and nearly cried for my Mommy. 1.6 miles from the finish line, and on a pace to blow my “PR” (Personal Record) out of the water, and I thought, “Oh crap, I’m going to have to crawl on my hands and knees for a mile and a half to finish this thing. And I would have done that. Seriously. Fortunately, a very helpful person stopped, and asked if I was OK.
“Yeah, I’m fine!” I sucked it up, smiling. “No, you’re not,” she said. We’d passed each other several times over the course, so we sort of “knew” each other. Turns out she was a physical therapist. How’s that for a stoke of good fortune? She gave me some electrolyte stuff she had, and jammed her thumb into my calf muscle, almost immediately relaxing it. “Stop the run-walking and just walk. Slowly” she… ordered me. I headed her advice. It was hot (for Seattle, not Phoenix hot, but hotter than I’d ever trained in) and I was pushing it too hard. Hence the cramps. The last 1.5 miles were the slowest of the race, and while it felt like I was fish-flopping on the ground for an eternity, turns out that according to my handy-dandy RunKeeper app it was only about 17 minutes. But I finished. In 3 hours and 16 minutes. A “PR” despite the cramp. The disappointing thing was that had that cramp not happened, I’d have finished in under three hours. That’s the goal for the next half — sub three hours. Who cares that the top “walker” finished in under two hours — walker? Sorry, but if you finish a half marathon with a sub 9 minute mile pace, you’re not walking. Seems some people enter the walkers division just to “win”. Whatever. Bottom line was, I finished. I learned a LOT about how to “run” a race. I met new friends. I hate that chick in the pink shirt that I could never quite catch up to. I love that 74 year old man. And I truly, truly appreciate the physical therapist that stopped and helped me, while her clock was ticking. He’s right. I’m ready for another half. I’m working my way to a full marathon, which I’ll likely do once, just to flip the Finger at heart disease, then I’ll back down to half’s. Maybe I’ll finish a full marathon, maybe I won’t. But I’m going to be finishing a lot more half’s, that’s a promise! What’s with the Springsteen lyric at the beginning of this piece? That song, Badlands, was my “theme song” for this race. The cadence is perfect, and I love that lyric: It ain’t no sin to be glad you’re alive. I sure am glad, and I plan on being alive for a long time to come. The Boss was with me at the beginning of the race, through the cramps, and at the finish. Thanks for the push, Bruce. That is great Jay! It is a very inspiring story and I am going to start my journey now. I have always hated walking and hate running even more but I think signing up for a 5k will get me started. And with my new obsession with podcasts I have plenty of content to listen to on “my” journey. Thanks for sharing and congrats on such a huge accomplishment. Thanks, Ty! When I first started walking, I was lucky to make it a mile in 20 minutes. But it got easier every day. Yep, it can be boring at times, but music (and podcasts) help pass the time. Do it, you’ll feel better!